We have all had sleepless nights, but for millions of post-menopausal women it happens 61 percent of the time, affecting their quality of life and their relationships. I, too, suffered from insomnia, thanks to irritating night sweats provoked by fluctuating hormones. Being sleepless through menopause made me irritable and fatigued daily. I had difficulty concentrating and it created tension with my husband because I was cranky and impatient. There are two types of insomnia. According to the National Institutes of Health, primary insomnia is its own disorder. A number of life changes can trigger primary insomnia, including long-lasting stress and emotional upset. Primary insomnia generally occurs for periods of at least one month. Karen Giblin, Founder of Red Hot Mamas North America, recently conducted a sleep survey with Sunovion Pharmaceuticals Inc. I was not alone! Most of us blame night sweats for insomnia, but I was surprised to find out that many menopausal insomniacs don’t suffer from night sweats at all. So what’s keeping us up at night? Let’s not forget the recent studies last year that found a lack of sleep contributes to weight gain. When you are sleep-deprived, your metabolism does not function properly. Sleep is also necessary for the nervous system to function properly. •	Exercise daily. Vigorous exercise should be done during the morning or afternoon. We are all different and require different amounts of sleep to feel rested during the day. The North American Menopause Society (NAMS) says, “Most adults require 6 to 9 hours of sleep each night.” I was lucky to get 3 hours of uninterrupted sleep a night – what’s a menopausal gal to do? •	Document what keeps you up at night. •	How long did it take for you to fall asleep? •	How long did you sleep in total? •	How did you feel the next day? •	Talk to your partner and see if he/she has noticed any differences in your sleeping habits. 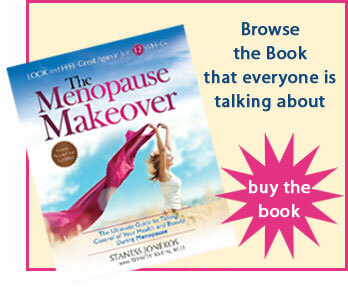 •	Discuss any lifestyle changes you’ve made to improve your sleep. •	Are you experiencing more stress? Getting a good night’s rest during menopause benefits your health, both physically and emotionally, and can contribute to a smoother transition. This entry was posted in hormones, homepage. Bookmark the permalink.